Summer in 2010, although it was a difficult decision for us, we made a plan to go back to the mainland. Right before we moved away from Hawaii, I hired a professional cameraman for my husband's birthday. It was a surprise gift. I told my husband "Please put on your aloha shirt and get in the car." I drove everybody to the point where I was going to meet the cameraman. "Surprise!" I explained everything to my husband there. It was fun! We walked around the beach that we walked over hundreds times during our stay in Hawaii. Pro-cameraman followed us and took many photos from different angles. This became a great memory of Hawaii for us. Unfortunately, the first house we were going to buy in Las Vegas couldn't become ours, because the previous owner raised a lawsuit against the bank. I soon called the moving company and asked to keep our moving stuff, which was over 300 boxes, in their place in California for a little while. Amazingly, it took us two months to find our house to live in Las Vegas. Until then, we were stacked in the small condo with three dogs. It was an incredible moment when we finally bought our dream house that we are living now. I don't know how to put in words how happy we were! While we were walking with our dogs in the morning, we met Chloe's parents. We started to become good friends. 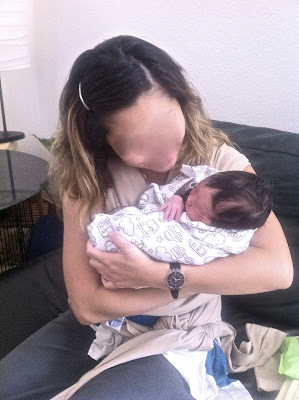 In 2011, Jack was born. Not only Chloe's parents, but we were also excited to see baby Jack! He was a very fluffy puppy and he was so handsome already! 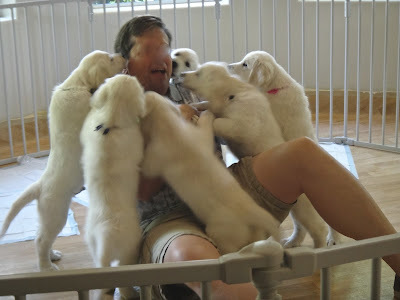 We didn't know one of our doggies was going to fall in love with Jack at that time. Summer in 2011, baby Haru-kun was born. The first time we met Haru-kun was only when he was two days old. 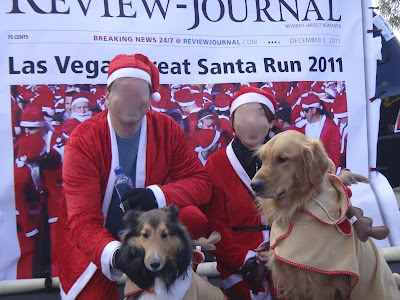 Winter in 2011, we joined the charity event called "Las Vegas Great Santa Run." All of the participants put Santa suits on and walked (or ran). 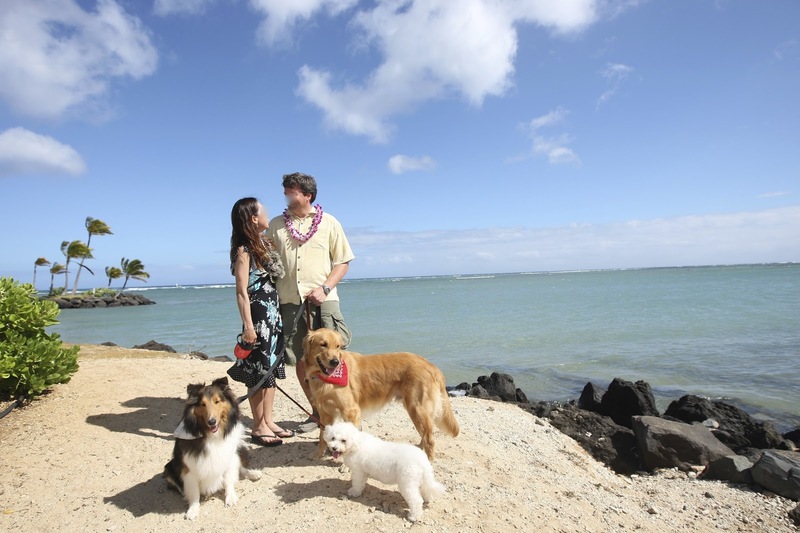 We took Kahlua and Kona to this event. 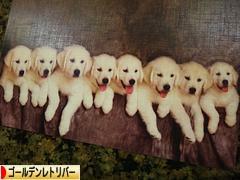 And also, the parents who lost their Golden in summer came with us. 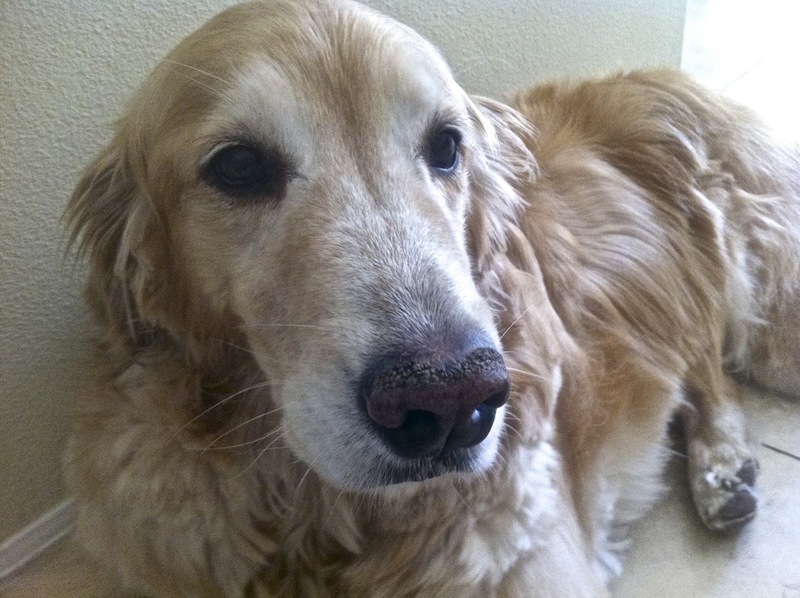 Early spring in 2012, Kona had a big surgery on his left arm. He was limping for a while before the surgery. We took him to the vet many times but no one could find the reason. When we finally went to see the specialist in town, he soon said "Kona's joint in his arm is rubbing each other and this is causing pain for him. We can plan a surgery tomorrow." This was the genetic problem. It was a long time for us until we finally got to see him. After that, we did all the rehabilitation together at home. 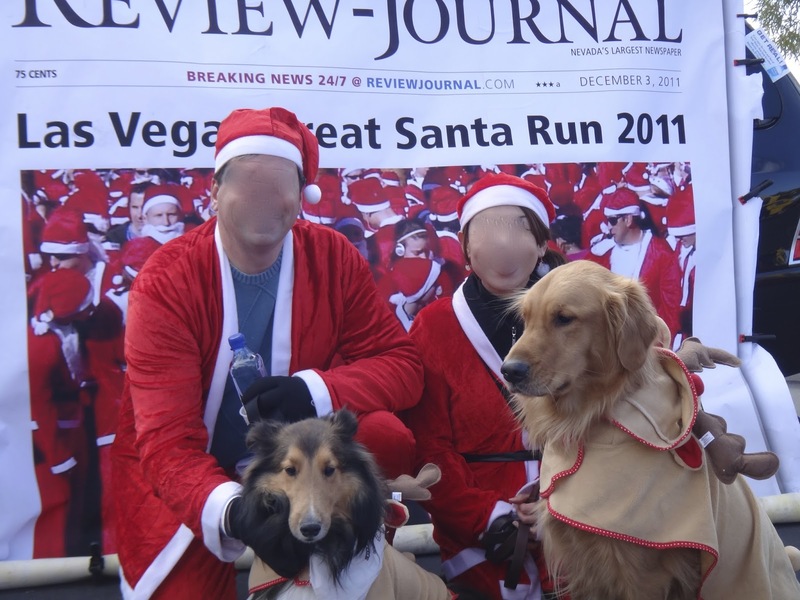 As you know already, we did some volunteer for Golden Retriever Southern Nevada in 2012. This photo was published as a calendar for 2013. Happy news! Ehime was born in 2012. We went to see her every Tuesday to let her know that we are going to be her human parents. My husband was brave enough to go in the puppy cage and I became a paparazzi for him. Do you see the very right one with an orange string? That's Ehime. With Chloe's & Jack's parents help, Ehime learned how to swim. She is growing the relationship with Jack. Let's see how it goes. At the end, we have one more news to tell you. We enjoyed living in Las Vegas, but we decided to move out to California. We would like to buy the land with grape vines. 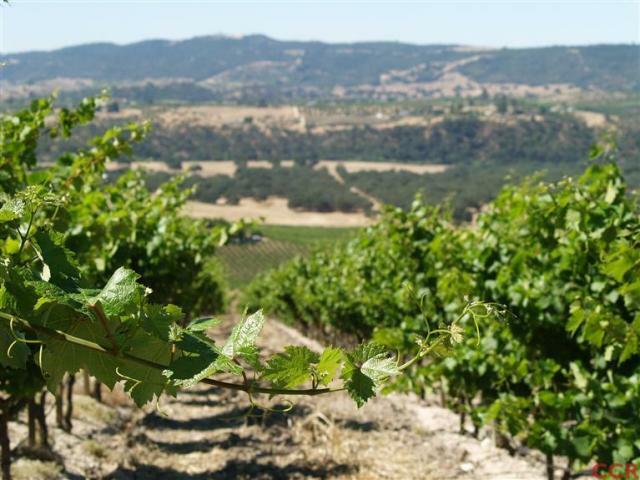 Owning the vineyards was one of my husband's dreams, and I want to make his dream come true since he was always supporting me since I came to USA. Our house is going to be on the market soon. We are not exactly sure when to move yet, but we'll let you know as soon as we find out. Ehime: "Wherever we are, our story continues♪"
For mommy and daddy who have been working hard to repair & clean the house every day, please click the puppy photo on the right above or dog picture below. Thank you!